Please see the U18 page for the match report for the game against the Irish Exiles. The U18 Lambs have beaten the Irish Exiles in a thrilling encounter at Mosley RFC. The Lambs were first on the score sheet but the Exiles touched down twice to take a 13-5 lead. The Lambs came back and scored with 3 minutes to go to make the tally13-12 to the Exiles before No. 8, Sam Hudson, slotted a penalty to give the Lambs victory by 15 points to 13. The Lambs Honors Caps are now available for purchase again. Please click on the picture below for details. PLEASE DO NOT USE THE WEBSHOP LINK IN THE MENU ABOVE!!!! The link for shorts and socks is below under the match wear section of the site. Please can you only order shorts and socks at this stage, due to our very recent change in sponsor Gilbert are currently redoing the specifications for all the kit and this will not be ready until later on in the week. If you are not playing in the Exile match you can order your shorts and socks at the end of the week. XV Rugby preview of the North v South match - click here! Book you ticket by clicking here! Please note that there is significant revision time built into the tour every day! The Southern Lambs lost 7-17 to the RFU South West Division in a tight competitive game. 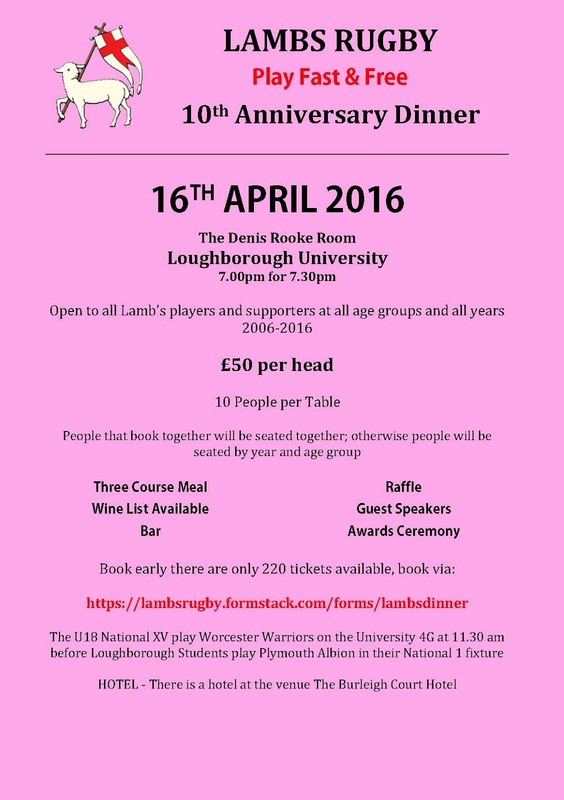 This was the Southern Lambs warm up before the North v South game next Sunday. The Northern & Southern XV squads have been announced and can be found on the U18 team page. On Sunday 10th January the four LAMBS regional sides pitted themselves against each other in two grueling contests as players fought for regional pride as well as selection to the next stage of the process. Despite the weather, the 3G pitches allowed for some ambitious running rugby, which was reflected with 16 tries across the two games. At Maidenhead RFC, it was the South West who took bragging rights for the first time in five years as they defeated the South East 20 - 10, Dan Hubble of Truro school bagging an impressive hat-rick. In Loughborough the North took on the Midlands with a high scoring game finishing 42 - 24 to the North. Following lengthy and drawn out selection meetings both regions have now selected their squads for the next stage. 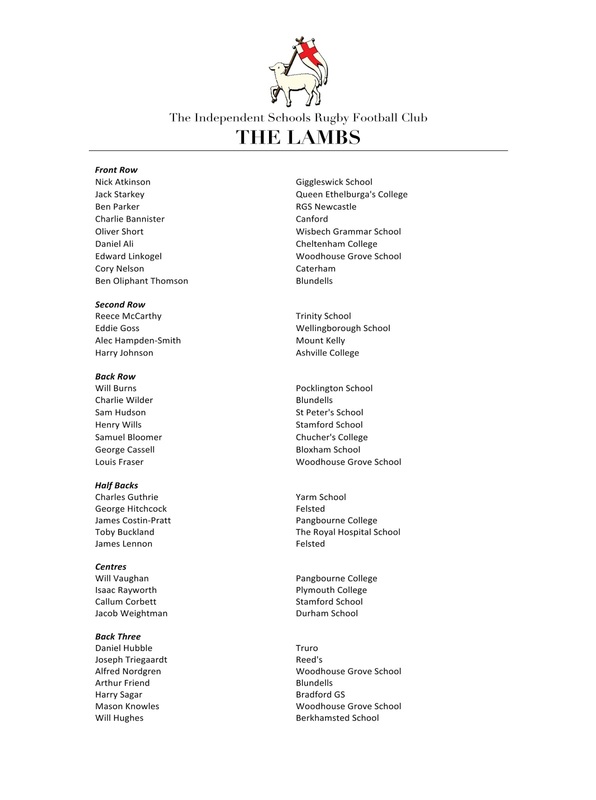 The South East and South West have created the 'Southern Lambs', who will take on the RFU South West Counties U18 Division on Sunday 17th January at West Buckland School before facing the 'Northern Lambs' on the 24th January at Loughborough University. 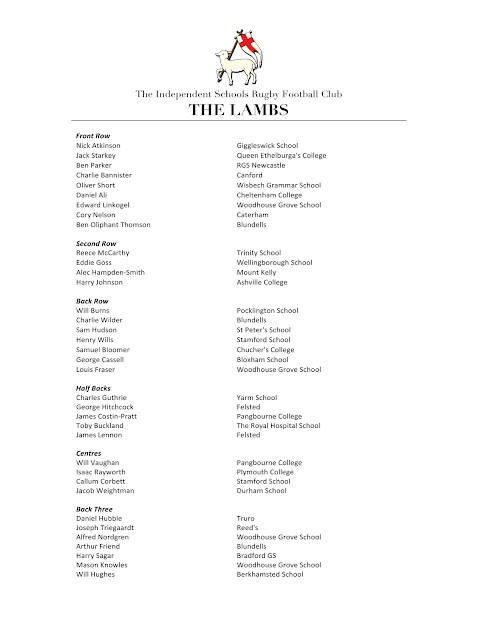 The Northern Lambs, made up of the North and Midlands squads, will warm up against Yorkshire U17s at Woodhouse Grove School on Sunday 17th. "The standard of the regional squads has been very good this year, the management teams in each region have worked hard and that can be seen in the style of rugby that has been on show. After some tough calls there are two strong squads going into the final stages before we select the final LAMBS squad, and I am excited to see what they will do." 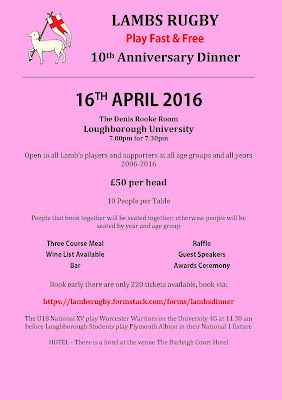 Please see the U18 page for details of the players selected for the 4 regional teams.